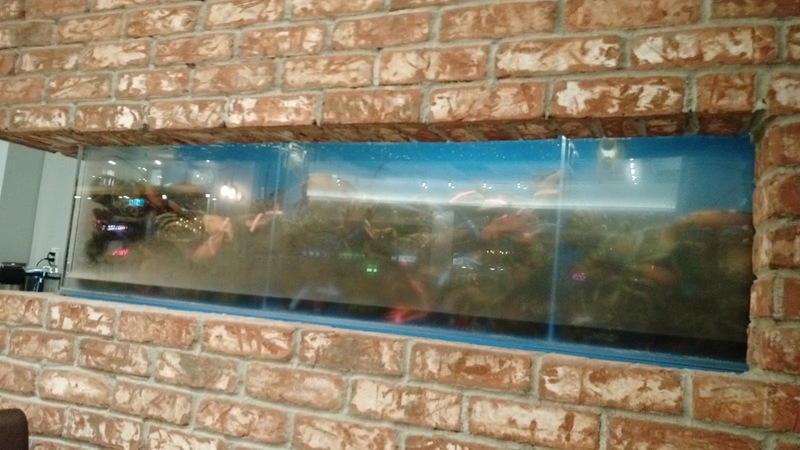 The restaurant was bright but was very poorly designed. For instance, the tables had these awkward legs that they could only be placed one specific way and diners must sit along the long edges. Otherwise, if sitting along the short edges, diners would constantly be bumping their knees against these table legs. Moreover, because the tables had only one possible way, the gaps in between two tables are very small, almost next to none. I noticed some diners felt uncomfortable and annoyed being so close to strangers. Now the food. After we ordered, we were served a large bowl of complimentary soup. 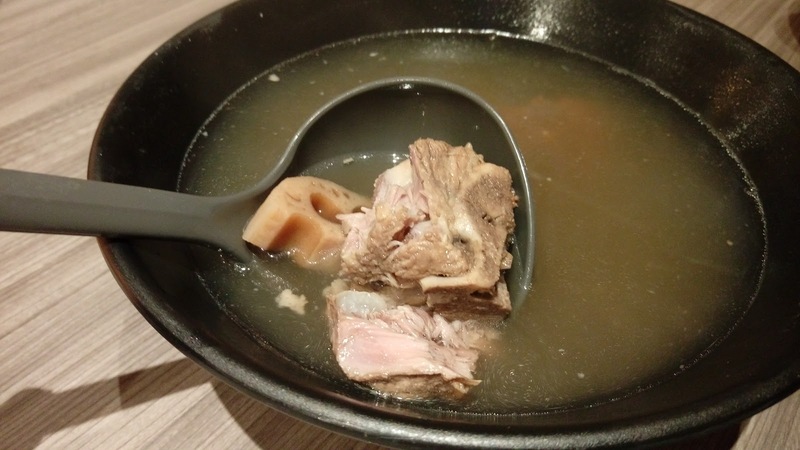 The house special for the day was Lotus Root & Pork Bone Soup 蓮藕煲豬骨. 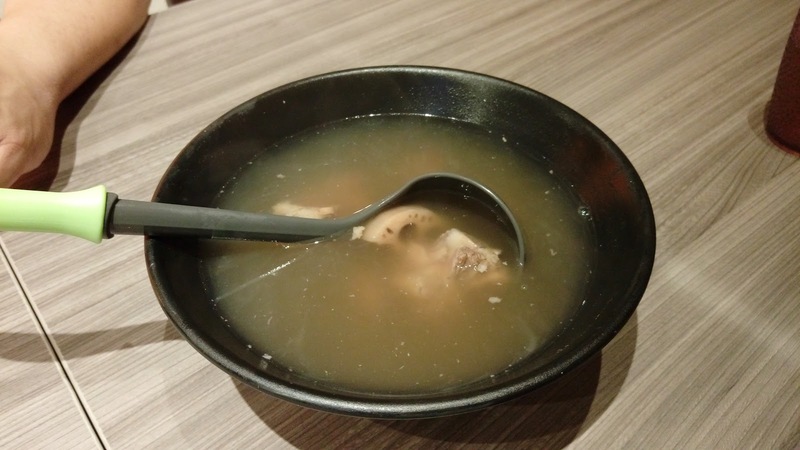 The broth actually didn't have much essence from pork bone or lotus root. Instead, a MSG-type of savoriness dominated the taste. 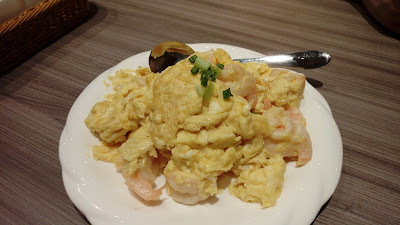 First dish to arrive was the Shrimp w/Scrambled Egg 滑蛋蝦仁. 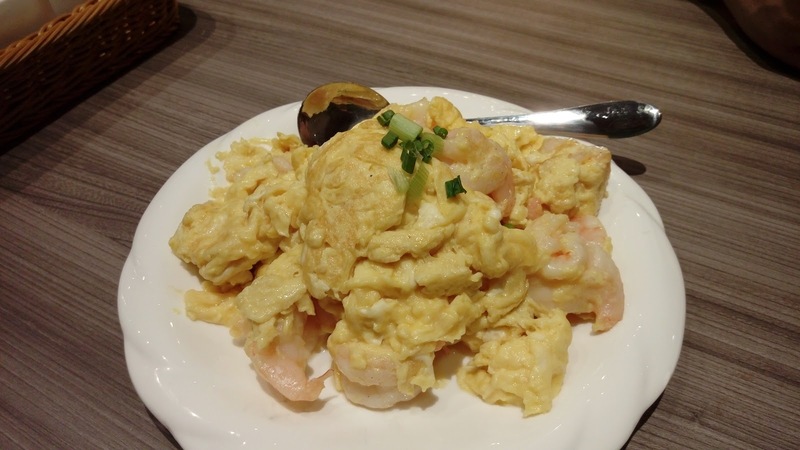 With large shrimps and appealing egg color, this plate was quite alluring. Well, don't judge the book by its cover. The overly soft shrimp lacked that snap crunch. Parts of the eggs were overcooked while others were under-cooked. What ruined this dish was the overuse of sesame oil. It was so overwhelming that there's even a small swamp beneath all that eggs. Even for Buddha Boy, who loves sesame oil and uses it in almost everything he cooks, was quite sickened by the exaggerated use. Imagine every single bite tasted as if you were taking a spoon-full of sesame oil. Not pleasant. Next was the Crispy Milk with Beijing Style Pork Chops 脆奶拼京都豬扒. 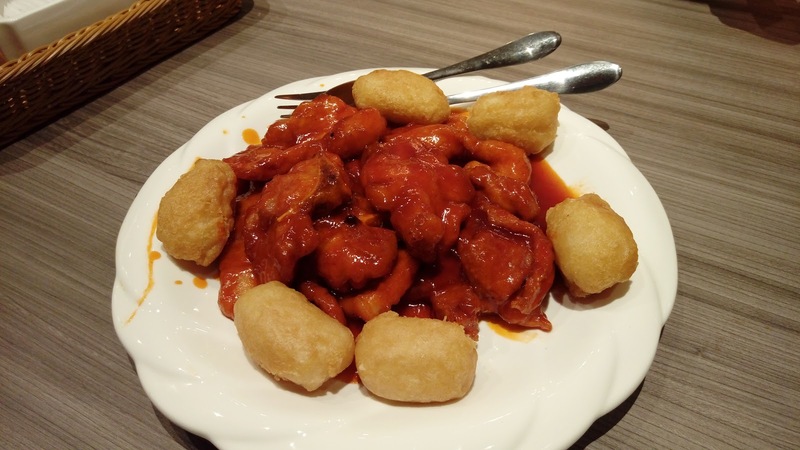 The meaty but thin chops were not seasoned so the meat itself was dull. However, that being said, the delicious coating of sweet bold ketchup-based sauce did tastefully accented the dish. The deep-fried milk had a crispy outer coat but the inside custard was bland and lacked that distinctive sweetness. We also had an order of Chicken & Salted Fish Fried Rice 鹹魚雞粒炒飯 to accompany the two dishes since white rice was not included. Not only this lacked wok-heat, this was also done poorly. 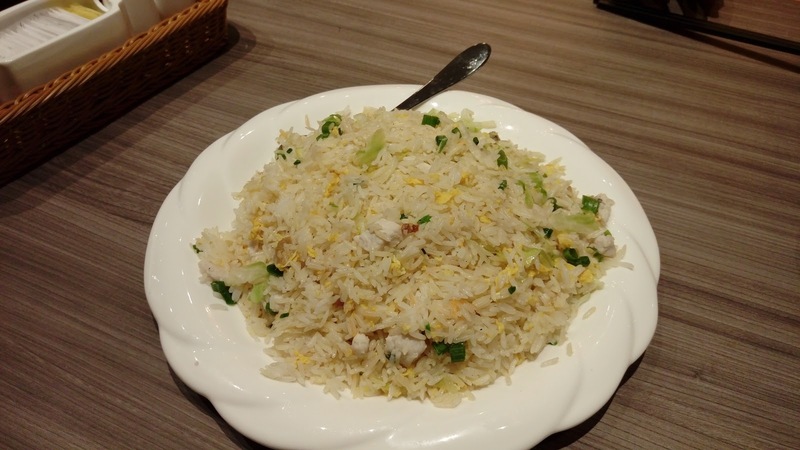 That peculiar salted fish flavor was not distributed evenly amongst the dish. 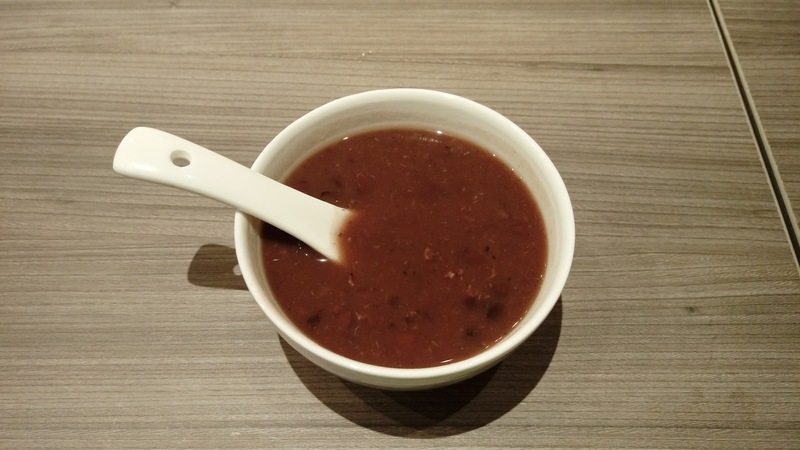 While the portion was acceptable, the amount of meat was sparse and the quality of the salted fish was below par. The rice dish came with a drink and I opted for Cold HK-Style Milk Tea 凍奶茶. The tea was very diluted and over-sweetened. Our meal ended with complimentary bowls of Red Bean Dessert Soup 紅豆沙. Couple spoons of this and I gave up. 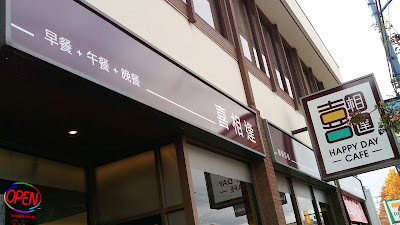 This lacked all that delightful fragrance of azuki beans. 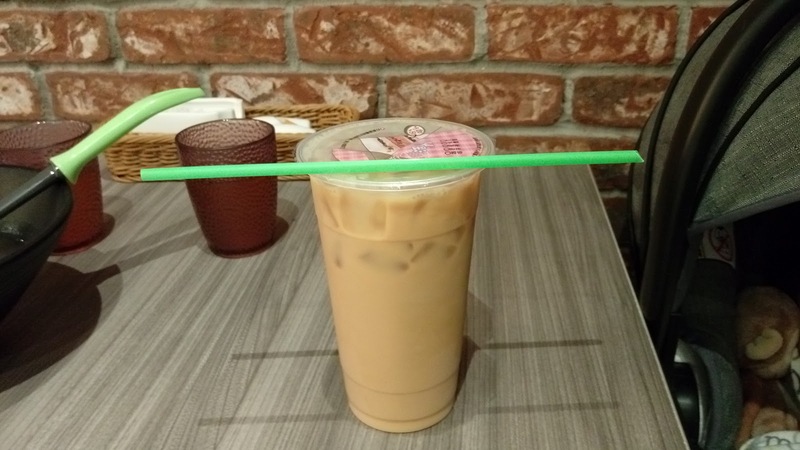 Also, this was so diluted that it really lived up to the name of "sugar water 糖水". Service was bad. Servers were not the most friendly people. Upon arrival, and after informing that I had a baby in car seat, the server insisted that I try sitting at a booth (that seats six people) by the window. I told the server that the car seat would not fit but she insisted that I try first, and so I did. With no success, she, unwillingly, directed me to a table at the back near the kitchen. One menu, two people. I noticed almost all the tables with two diners asked for a second menu, including us. Servers were not too pleased when asked. Many tables, including us, had to wave many times just to place our orders. And after we placed our orders, food delivery was sluggish. Oh, wait, correction, complimentary soup was fast, our actual orders were slow, super slow. At the end of our meal, I noticed that the large round table beside us were looking at the breakfast menu. Buddha Boy and I were also interested so we asked for one. The server told us that she would pass the menu once that table is done, then she quickly walked away. I was a bit choked. Really? The whole restaurant only has ONE breakfast menu? I confronted her when she passed by our table again. Then, unwillingly, she went and grabbed one for us from the front bussing station. Poor Service. Expensive menu. Sluggish Delivery. Substandard food. Wow, what a disaster this place is ! Sorry to hear your experience was so poor. Hopefully they will learn from unhappy customers soon so customers will *actually* have HAPPY DAYS when eating there. Hopefully I'm just the one off since the place just opened. Maybe later on everything will be more enjoyable, especially the service. 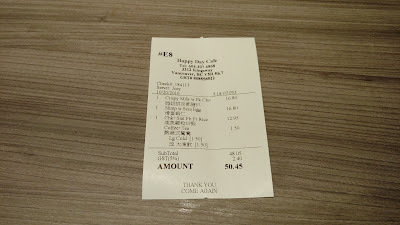 Yea, service is never really part of the deal at Chinese restaurants, especially HK cafes...LOL!